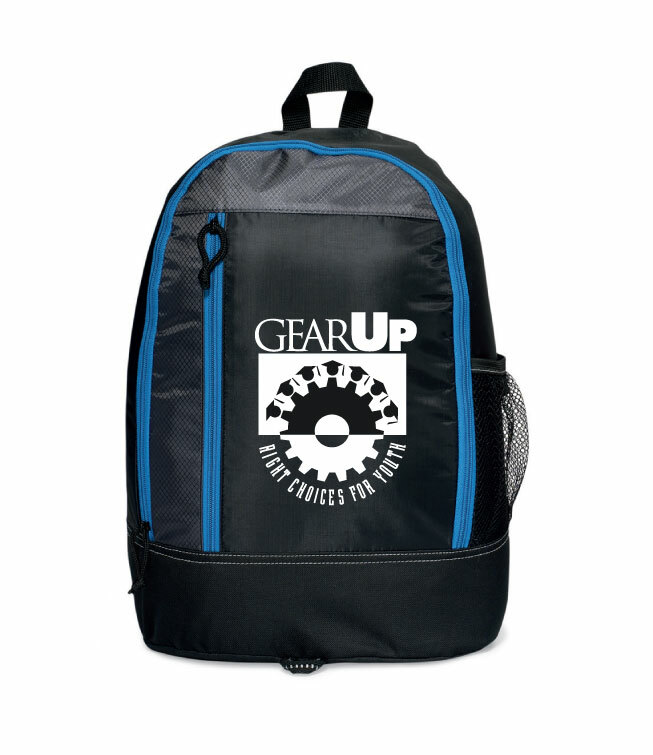 Black 1680D backpack with patterned 210D accent and front reflective piping accent for safety. 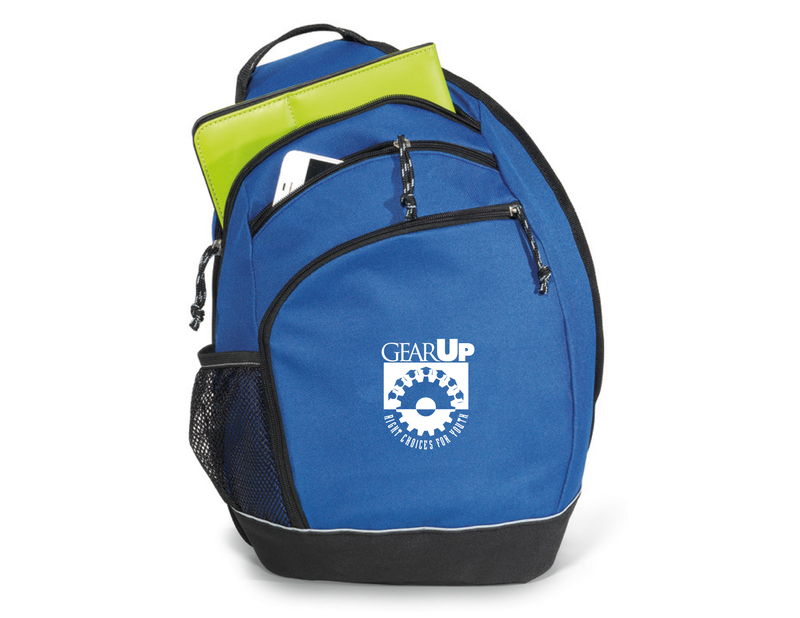 Large main dual zipper compartment, front zipper pocket with internal organizational panel. 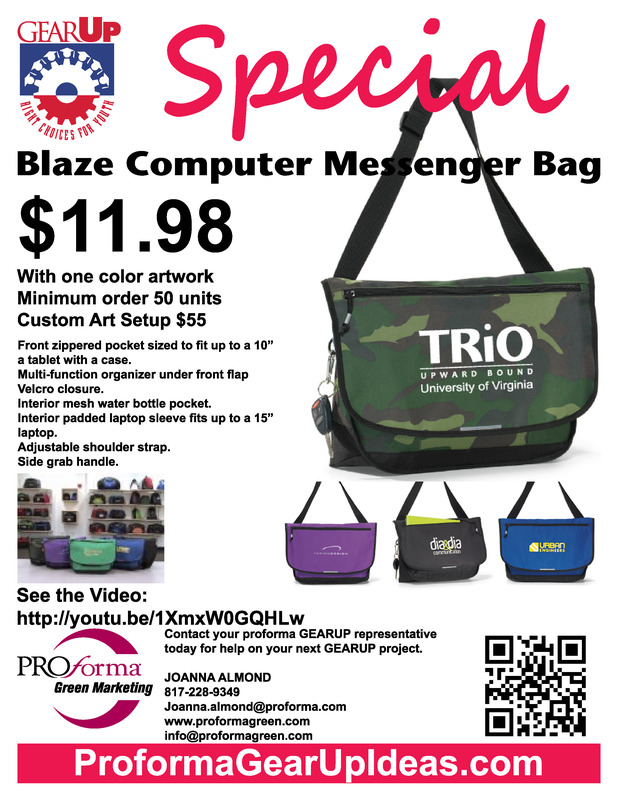 Large mesh side catch pocket and TSA-friendly zipper laptop compartment for easy inspection. 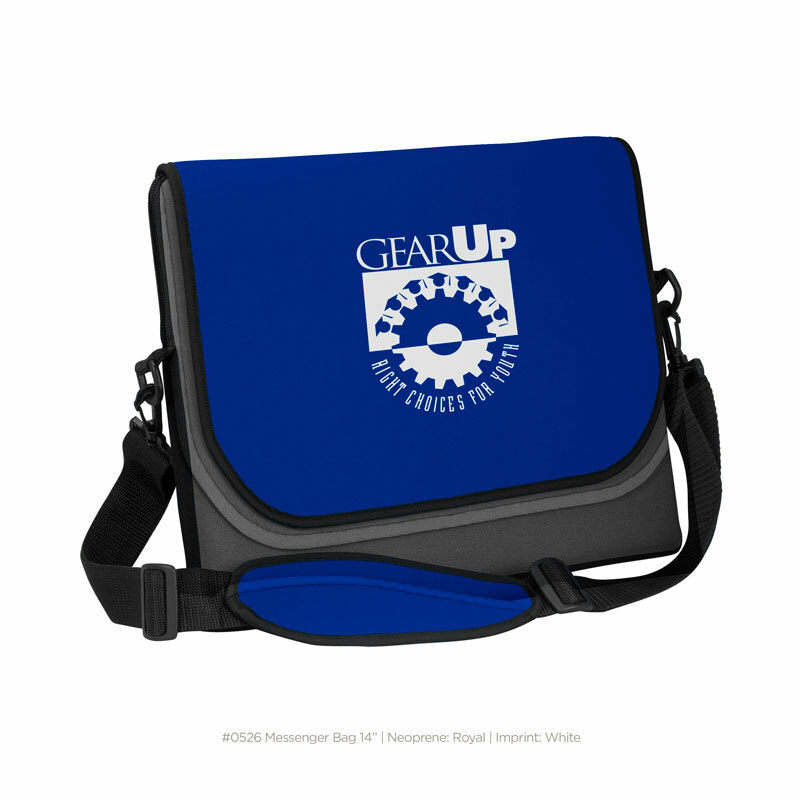 Fits most 14″ laptops. 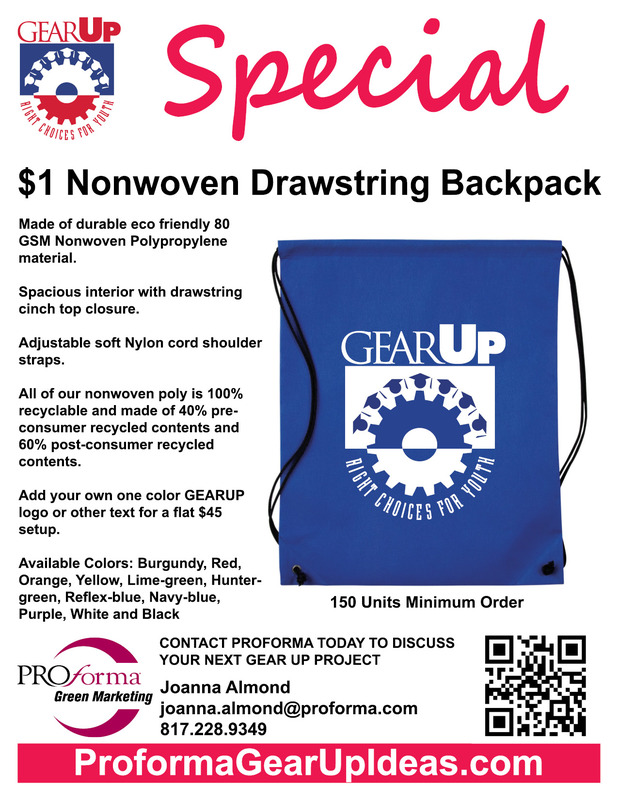 Top web handle with sturdy plastic guard, adjustable padded shoulder straps with mesh accent, and sternum strap. Extra padded mesh back panel for lumbar comfort. 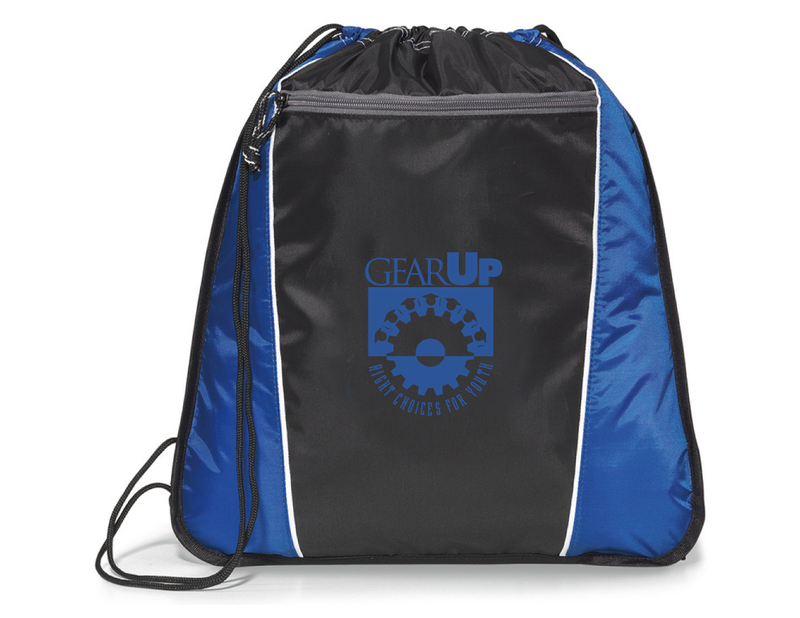 Durable black 420D and 210D polyester drawstring daypack. 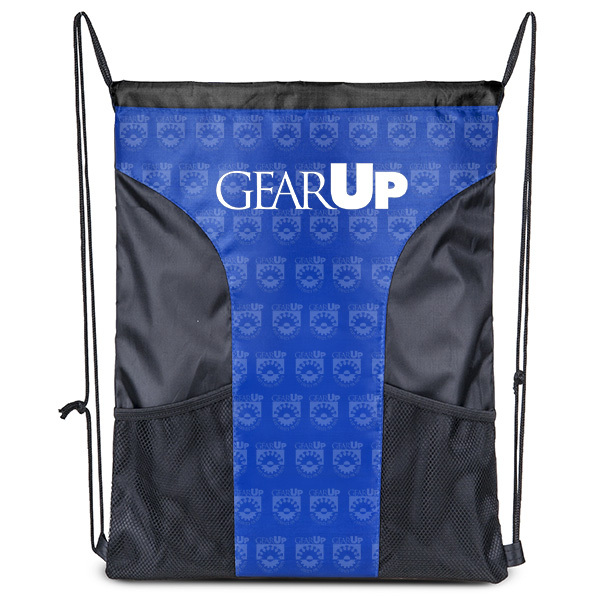 Bold color contour panel accent with double front black mesh catch pockets and black drawstring cord. Packs flat for travel. 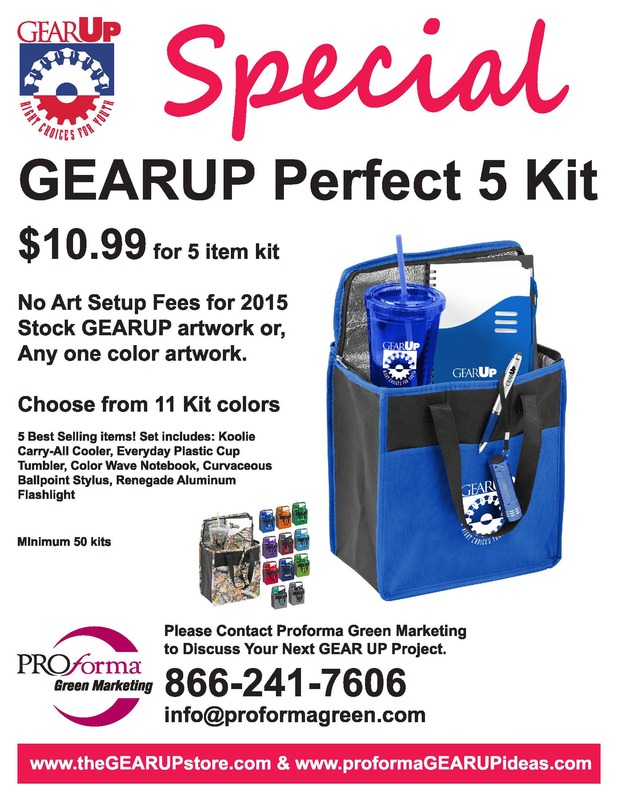 P5 Kits for GEARUP, 2015 pricing $10.99 for full kit. Minimum 50 units. 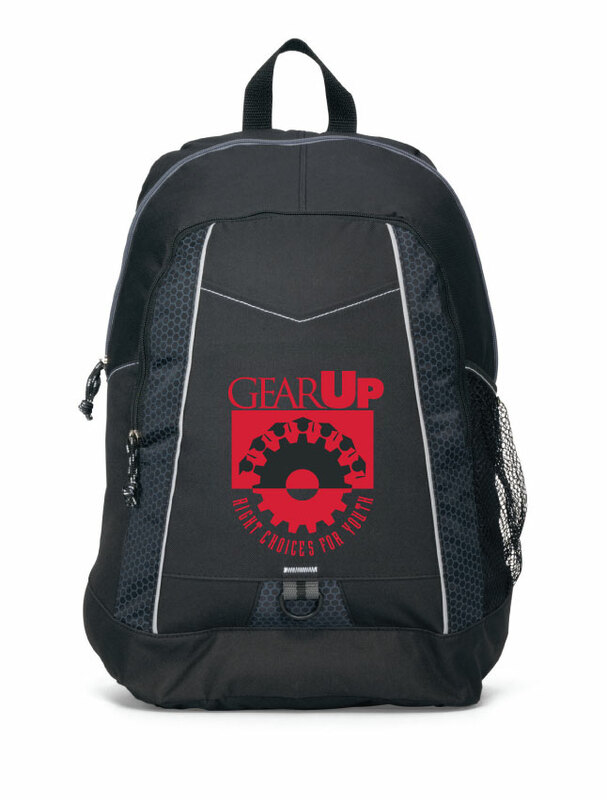 No art setup fees, so run with stock GEARUP logo or your own custom one color artwork. 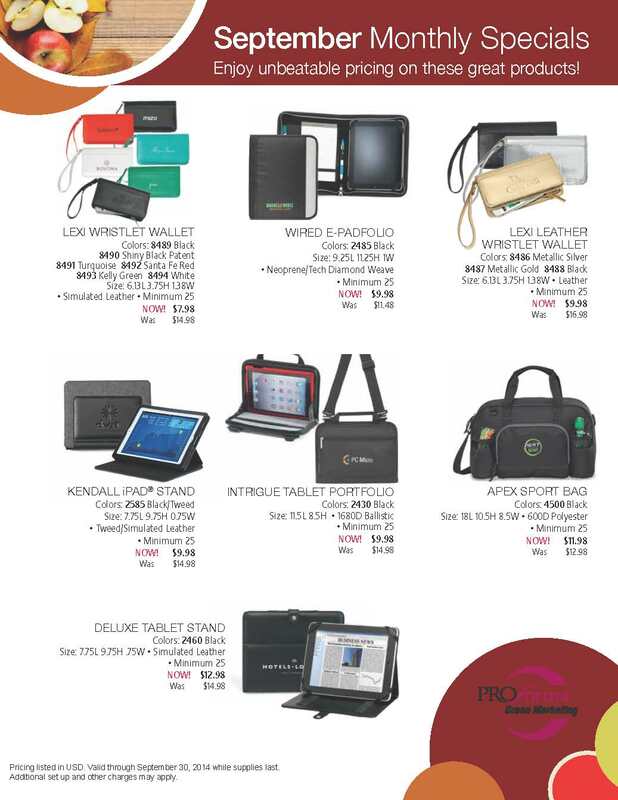 5 Best Selling items. 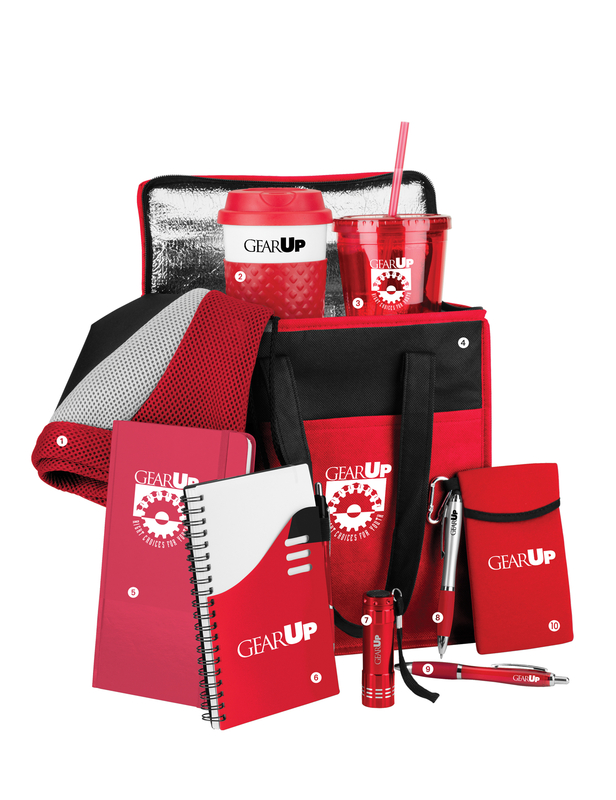 Koolie Carry-All Cooler, Everyday Plastic Cup Tumbler, Color Wave Notebook, Curvaceous Ballpoint Stylus, Renegade Aluminum Flashlight. Ensure convenient entry through security gates next time you attend a sporting event, concert or festival. 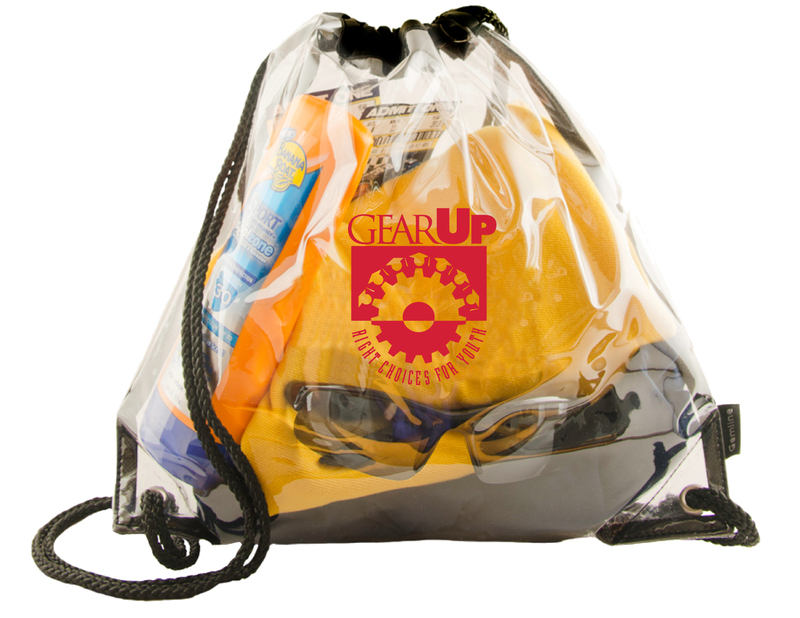 Durable clear PVC. Cinch closure. Meets current requirements for entry into professional sporting events (e.g. NFL & PGA). Maximum weight limit is 11lbs. 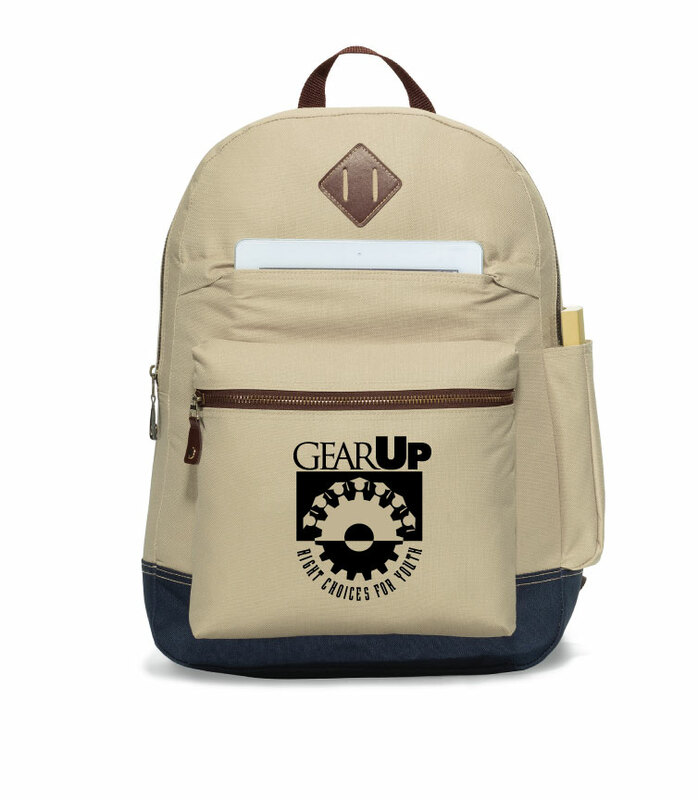 Easy access to main compartment with cinch closure. Front zippered pocket. 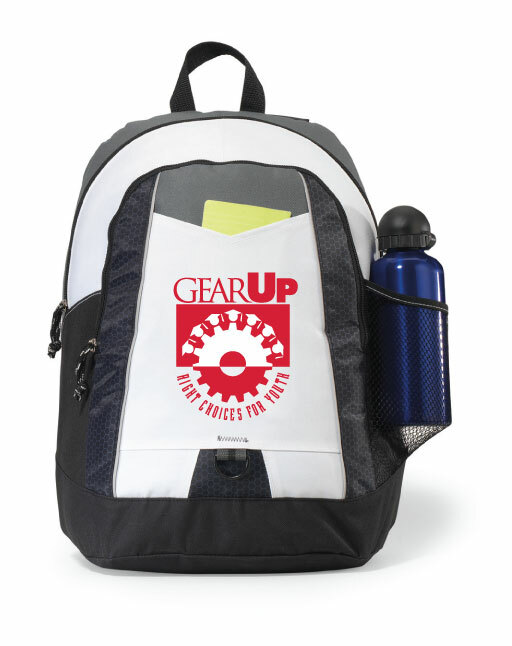 Cinch design allows for carrying on one shoulder or as a backpack. 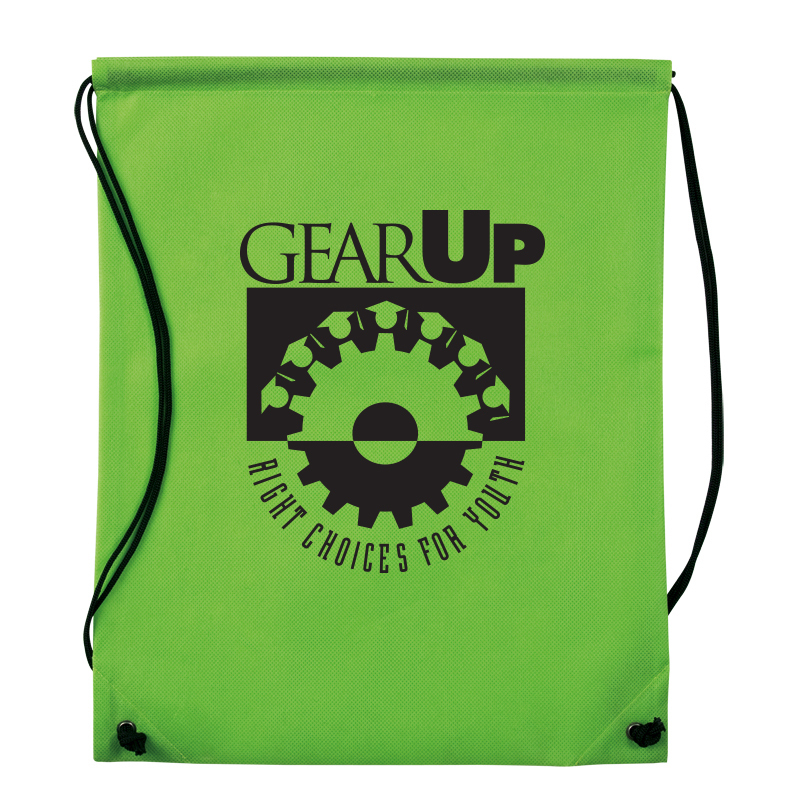 $1.45 Nylon cinch bags have great room for imprint. 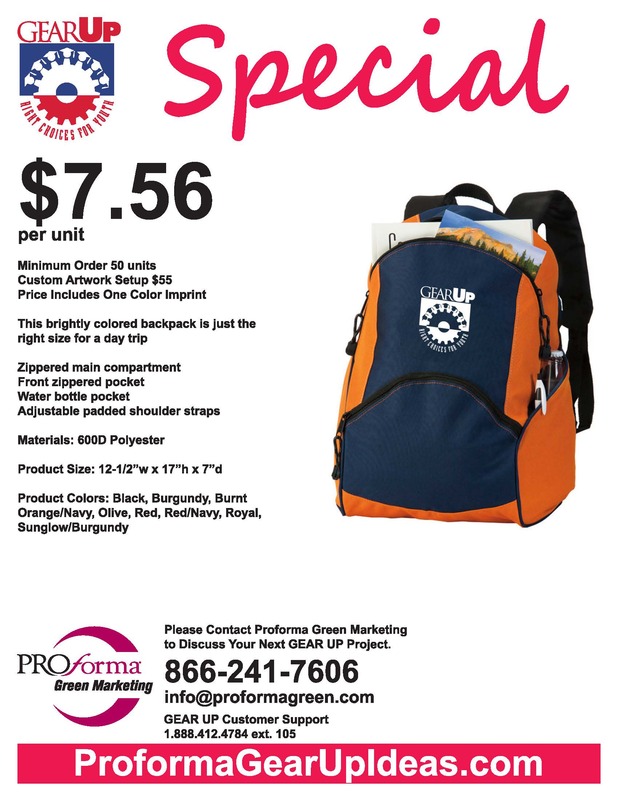 The Classic cinch up backpack from Jetline offers unparalleled value with a huge color selection to match your school, team or corporate colors. Made of 210D Polyester. 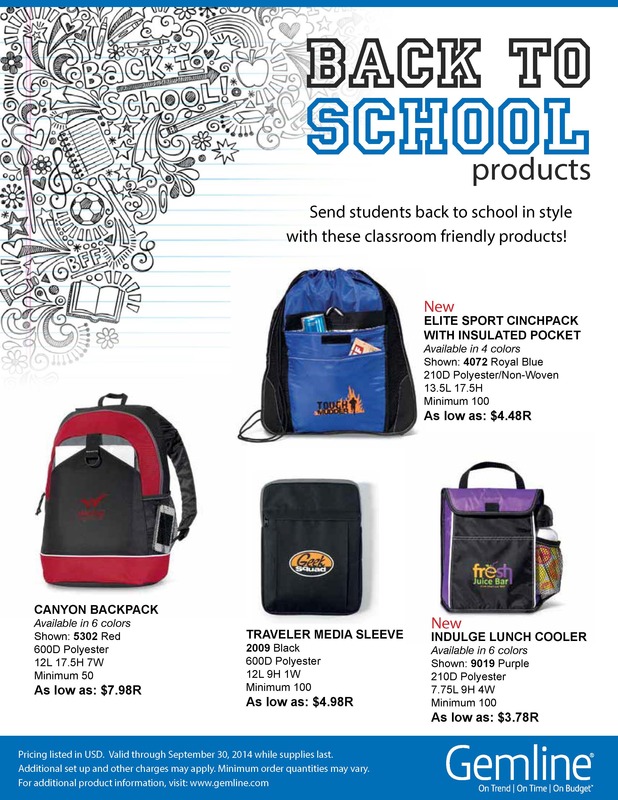 Proforma and our friends at GEMLINE are keeping the Back-to-School sales coming. 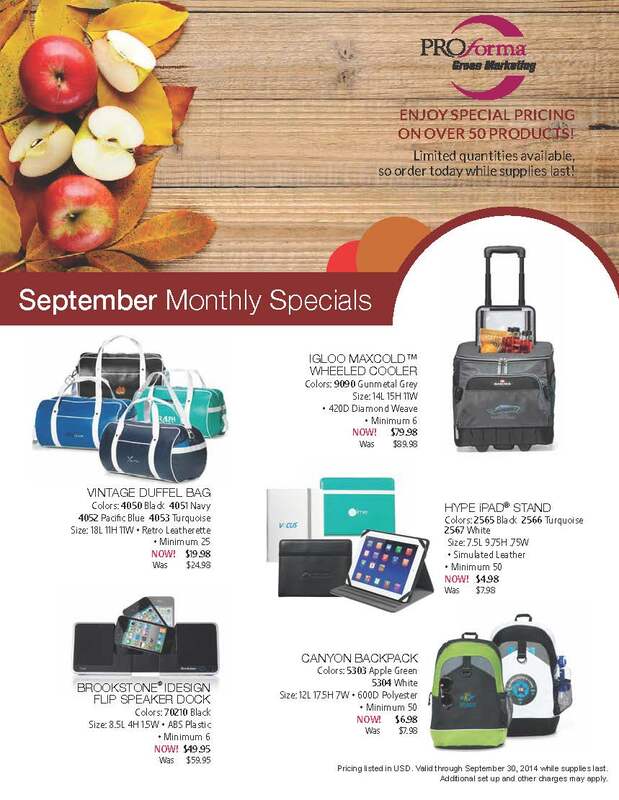 Here are the latest flyers for September to hit the office. 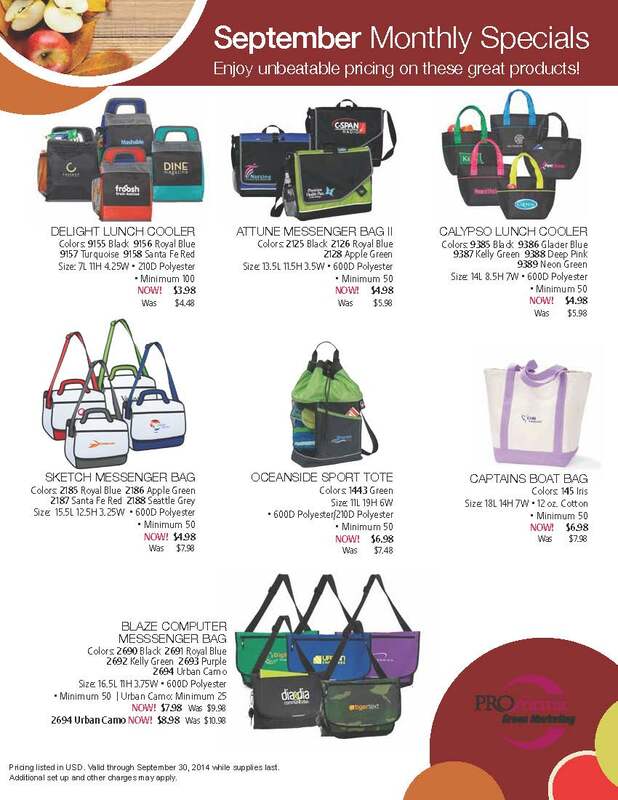 Samples of most bags are also available on request. 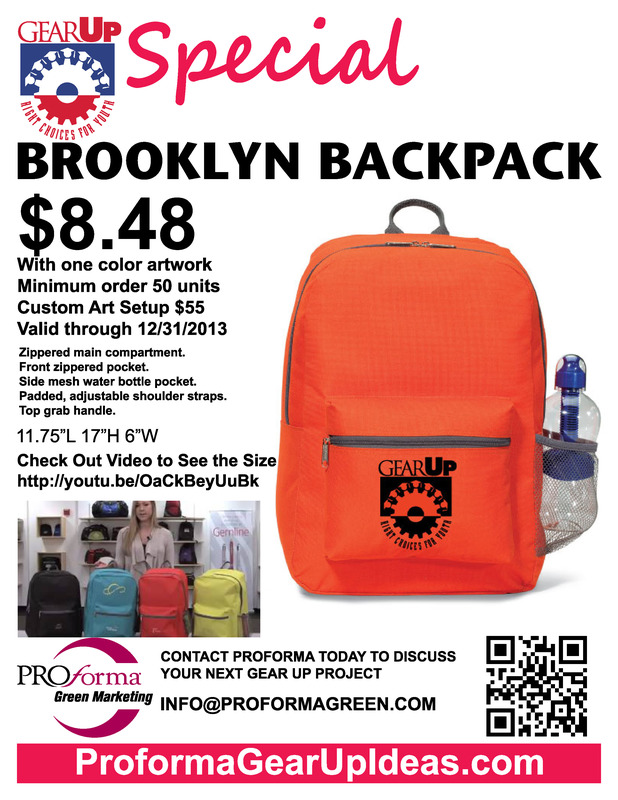 Remember, these prices include any one color GEARUP or custom logo. 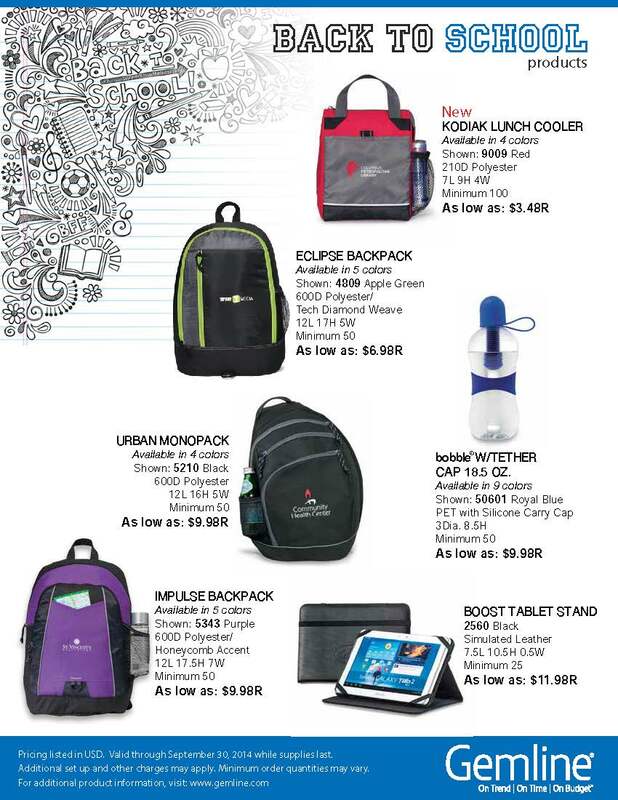 Our friends at GEMLINE are keeping the Back-to-School sales coming. Here are the latest flyers to hit the office. 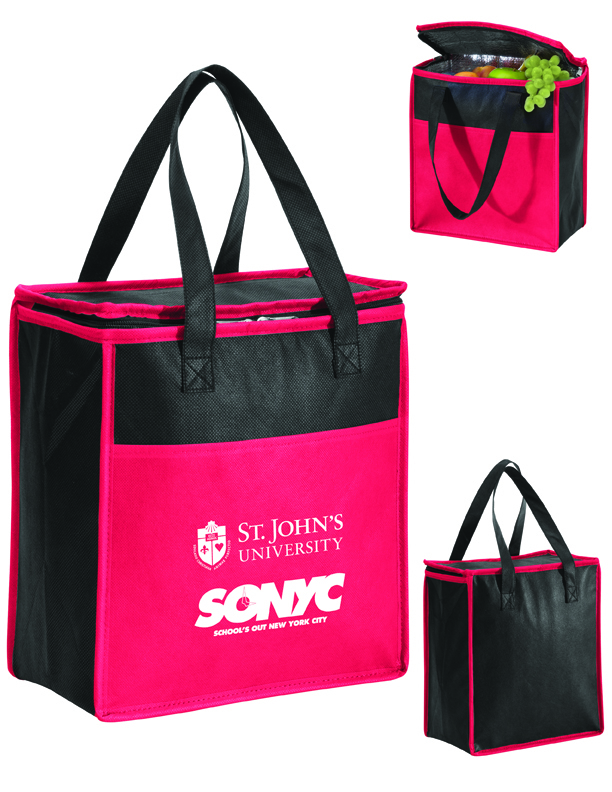 Samples of most bags are also available on request. 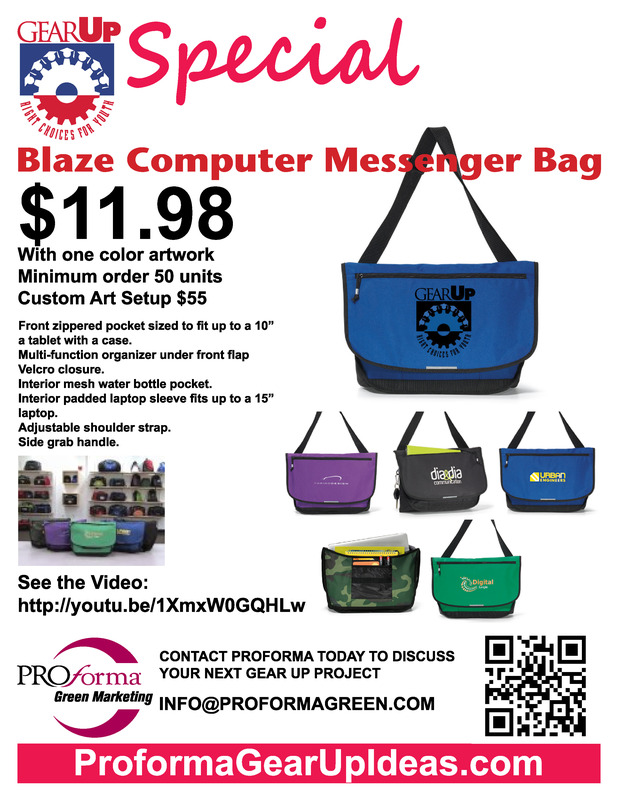 A functional business brief with the attitude of a messenger bag. 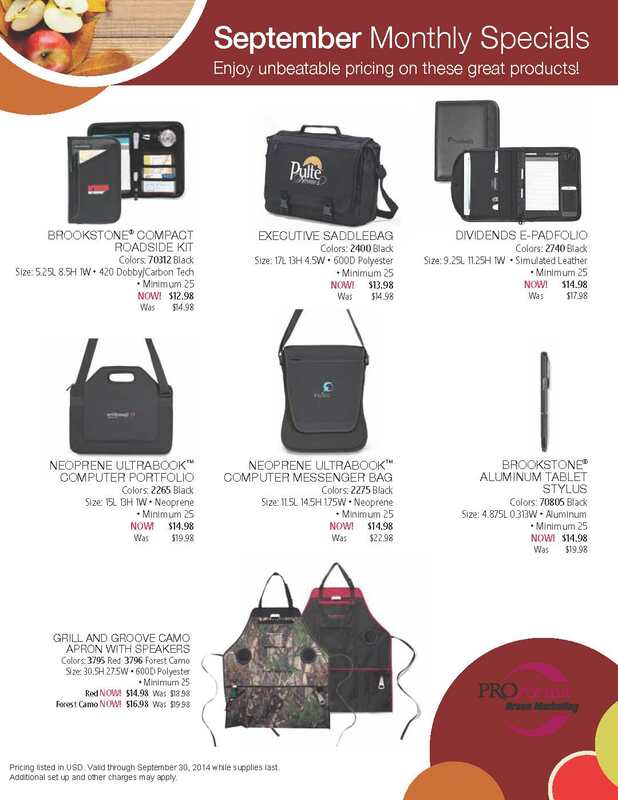 Multi-function organizer under front flap. 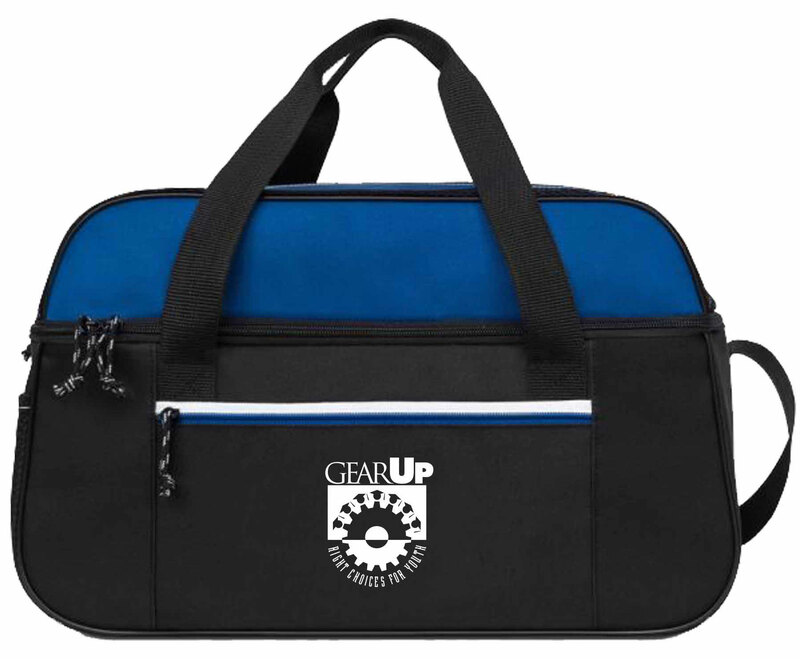 Computer sleeve (fits up to: 14″ laptop). 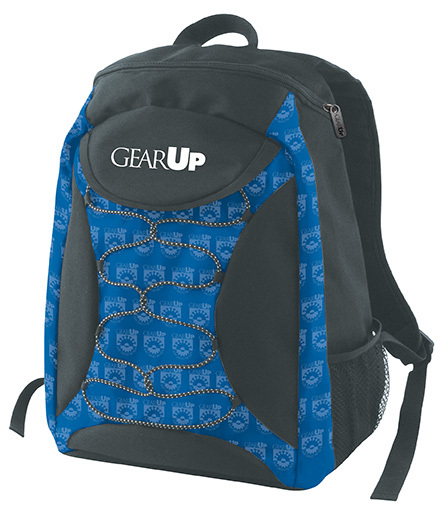 Front zipper pocket features MP3 player pocket with earphone exit. 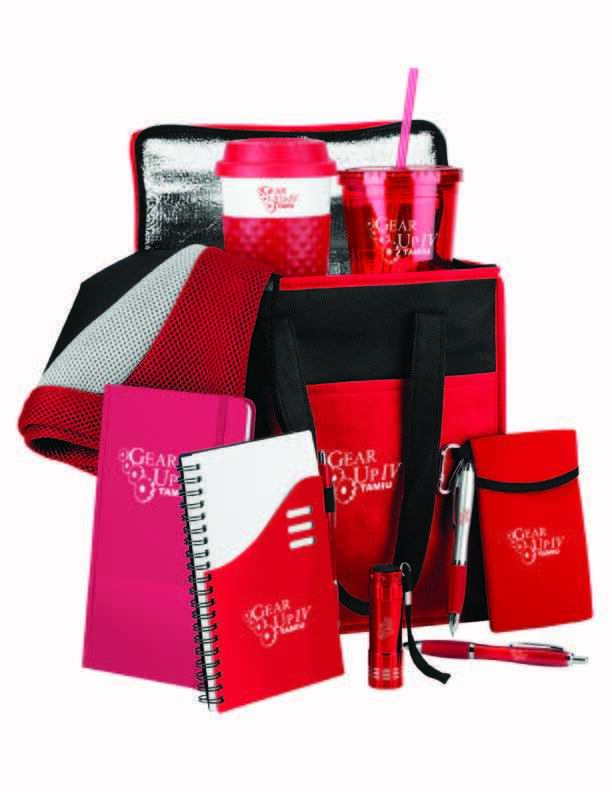 Maximize your branding opportunities with Logomagic decoration. 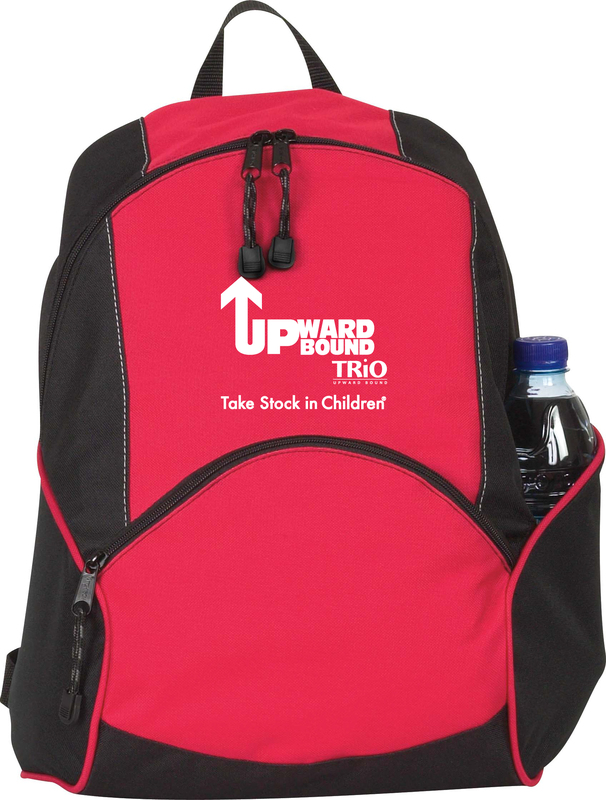 Adjustable, non-removable shoulder strap and top grab handle. 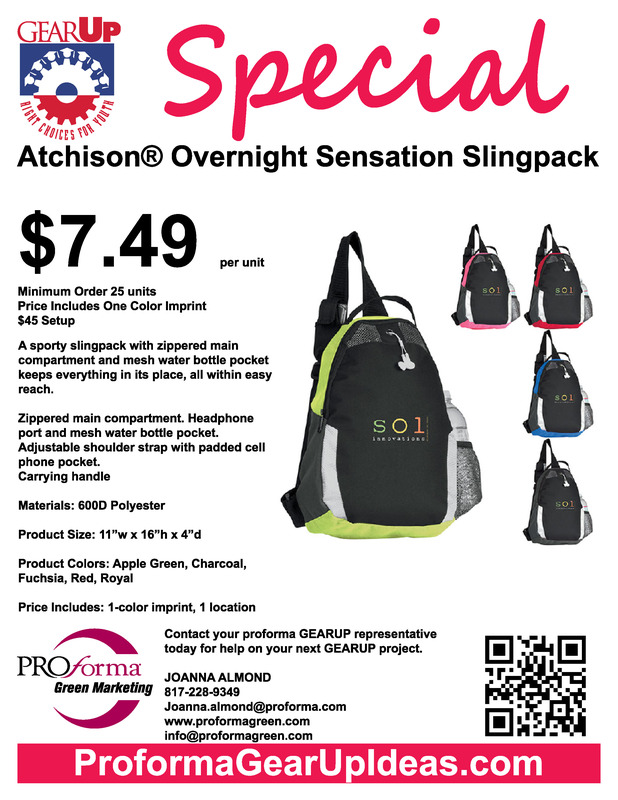 Side Velcro pocket to store your cell phone. 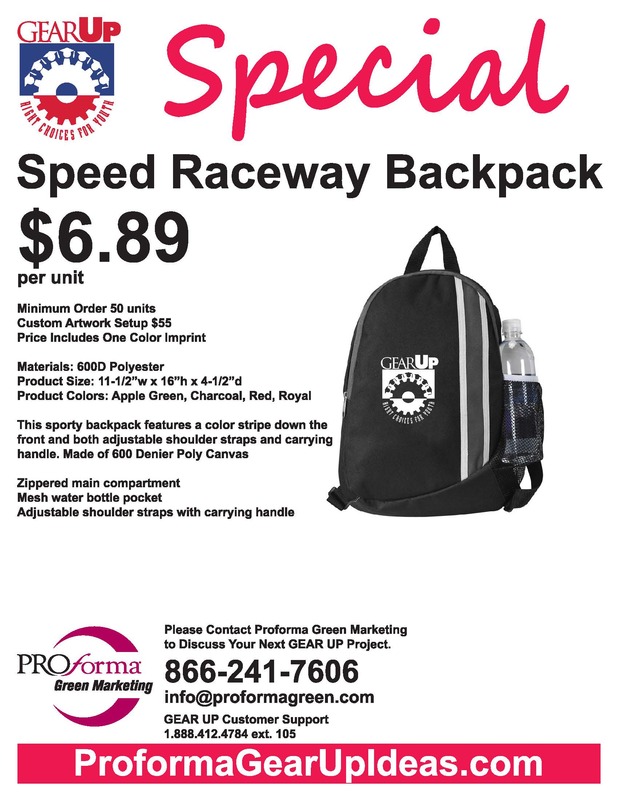 This sporty backpack features a color stripe down the front and both adjustable shoulder straps and carrying handle. Made of 600 Denier Poly Canvas. 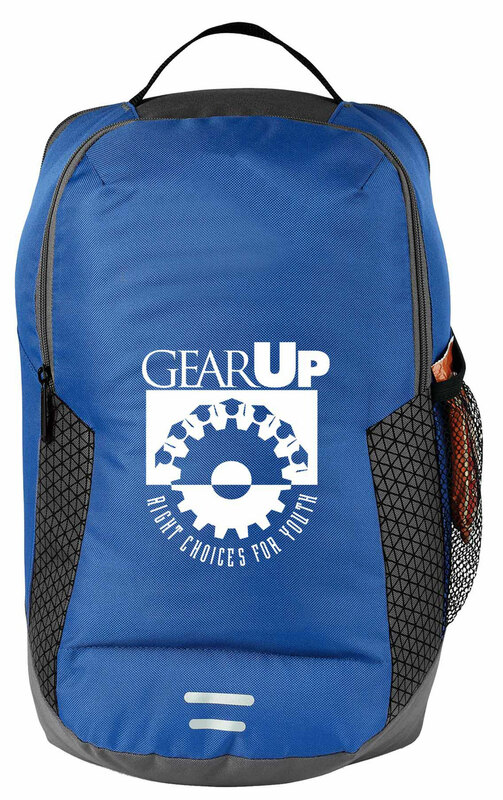 Our best selling bag for GEAR UP is back on sale. 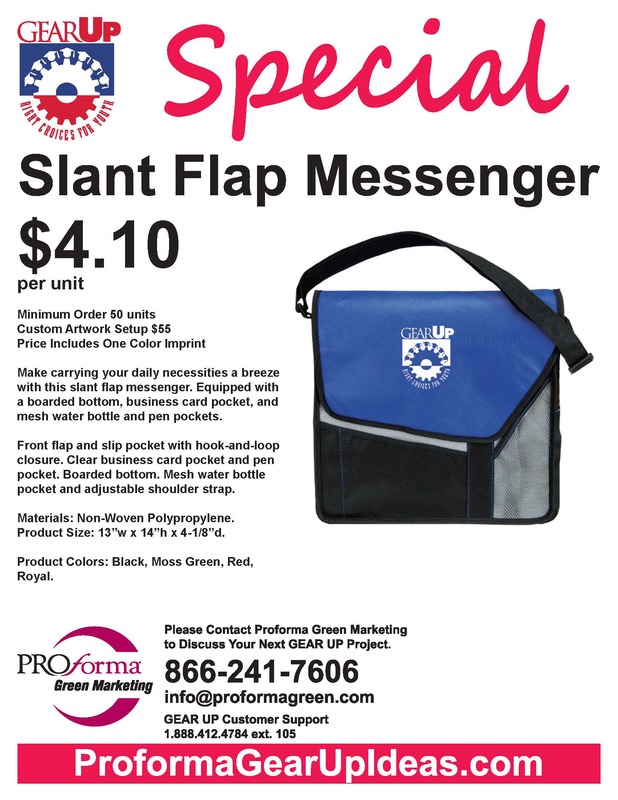 Make carrying your daily necessities a breeze with this slant flap messenger. 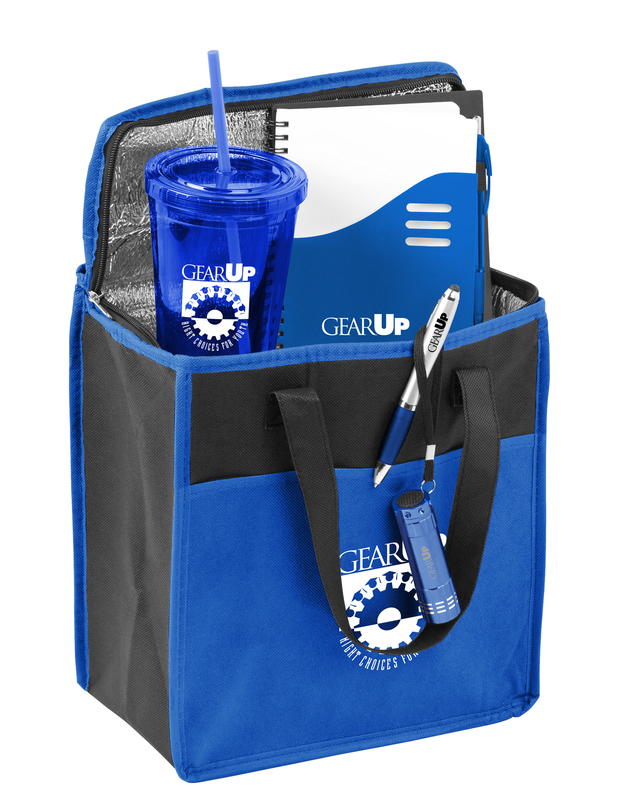 Equipped with a boarded bottom, business card pocket, and mesh water bottle and pen pockets. This backpack is just the right size for a day trip. Zippered main compartment. Front zippered pocket. Water bottle pocket. 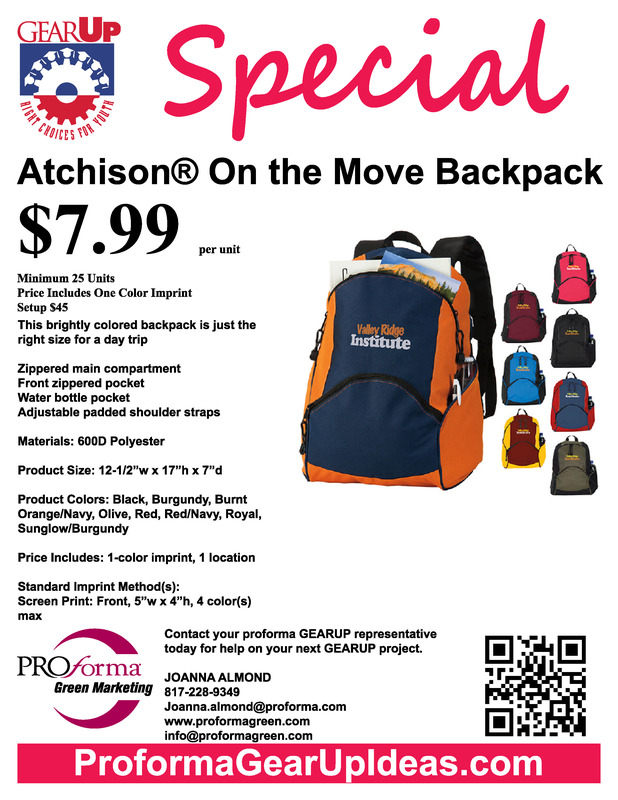 Padded adjustable shoulder straps. 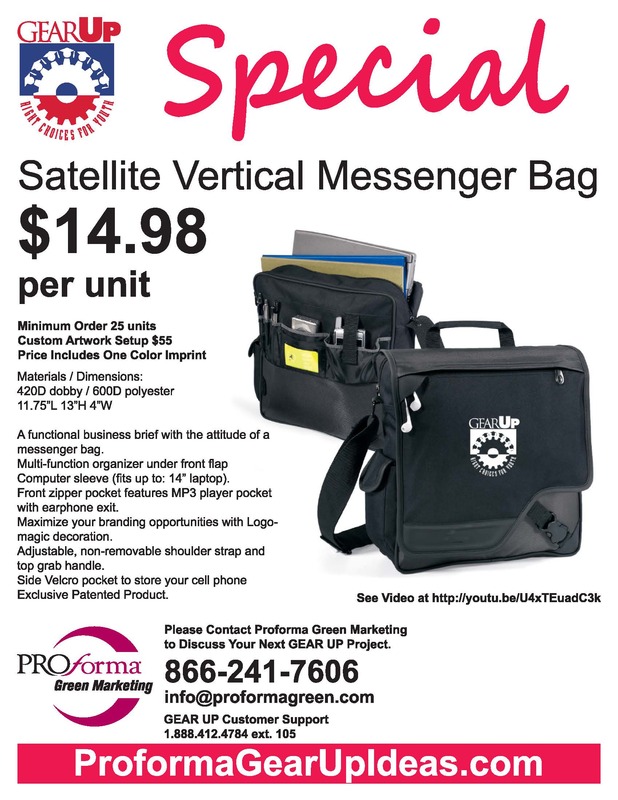 Front zippered pocket sized to fit up to a 10″ a tablet with a case. 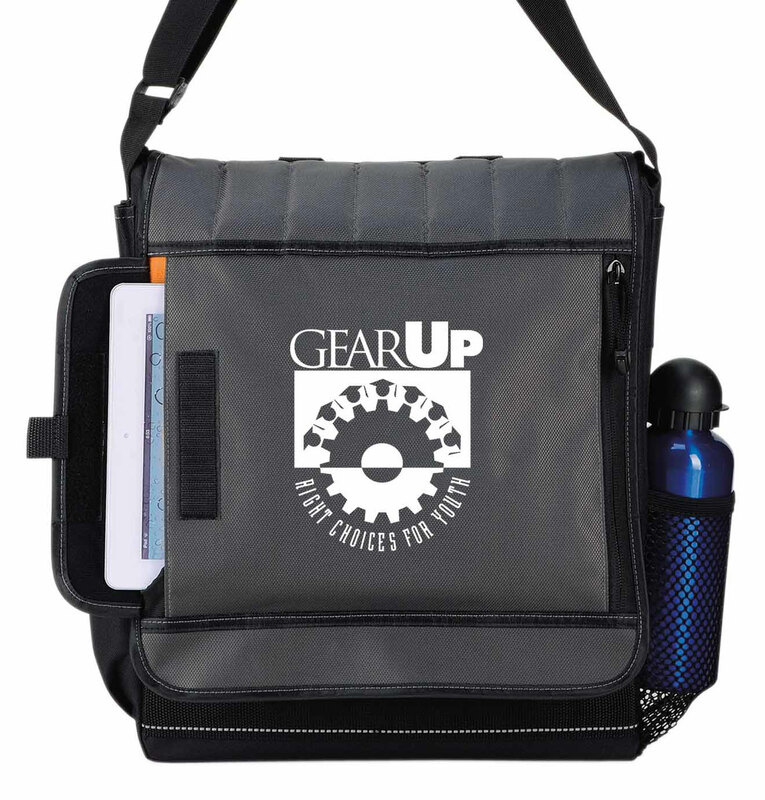 Multi-function organizer under front flap. 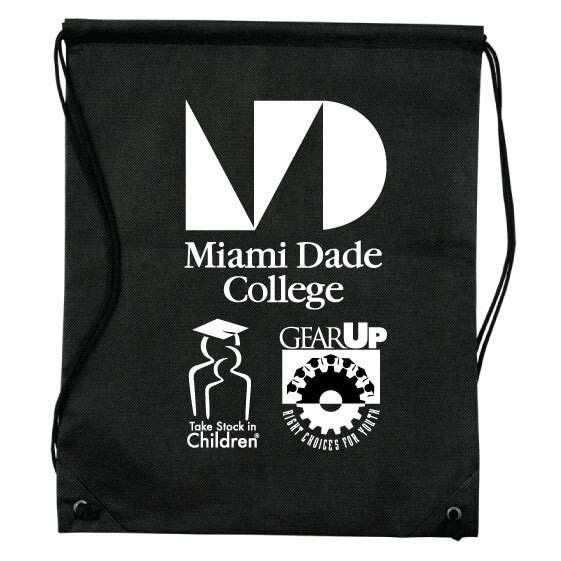 $1 Nonwoven Drawstring Backpack project – Miami Dade College – Wolfson Campus, February 18th. 5 color options. 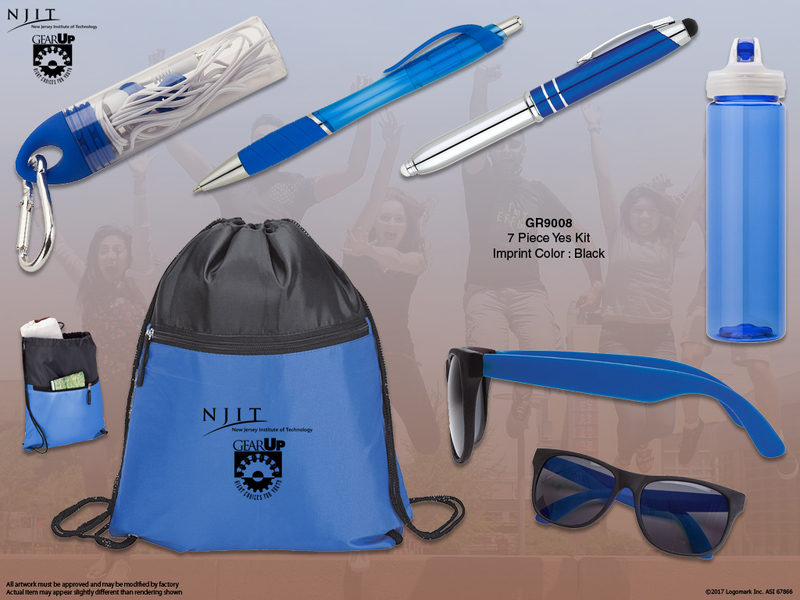 $12.98 per unit with one color imprint. Custom imprint setup is $50. Minimum order is 50 units. 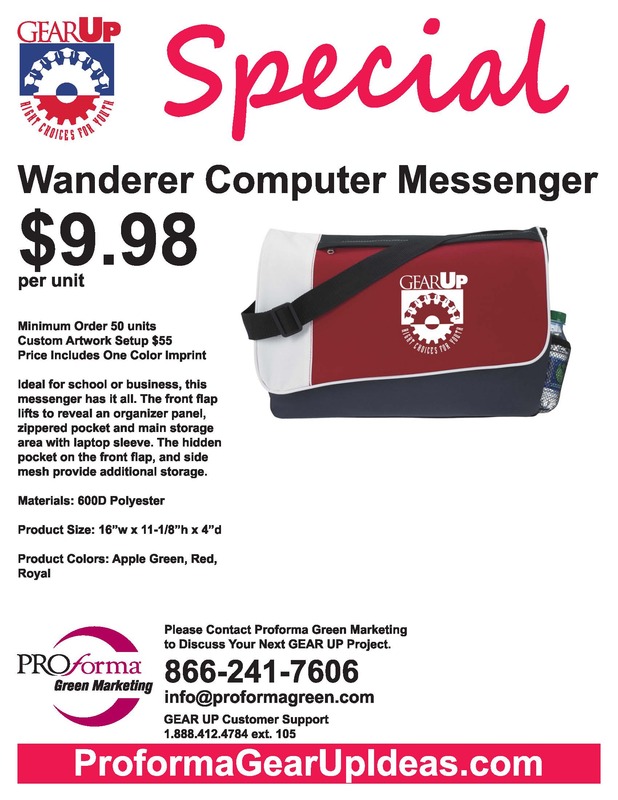 This computer messenger bag features a front zippered pocket sized to fit up to a 10″ a tablet with a case and a multi-function organizer under the front flap. 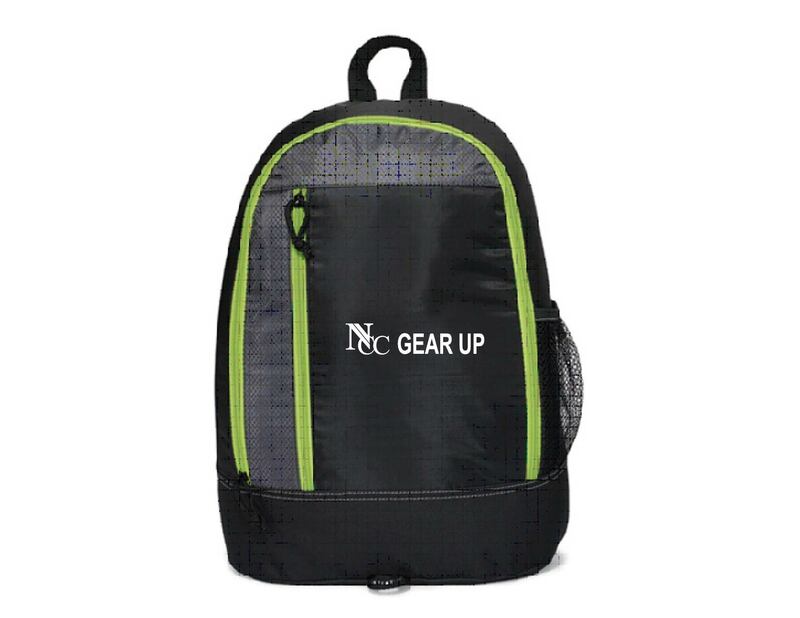 Other features include; Velcro closure, interior mesh water bottle pocket (water bottle not included), interior padded laptop sleeve fits up to a 15″ laptop, an adjustable shoulder strap, D-ring, and a side grab handle. 5 color options. 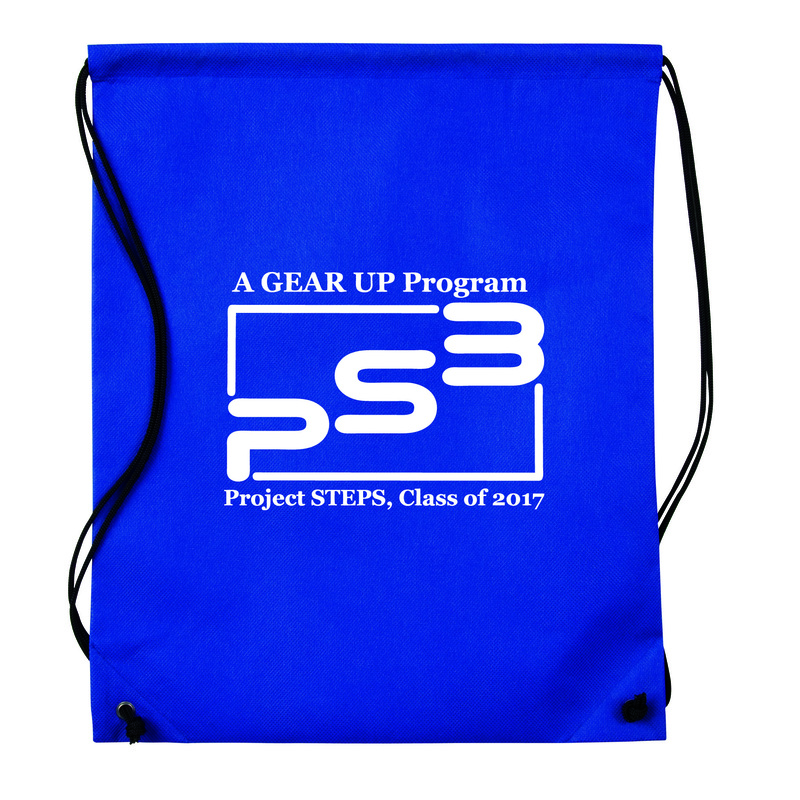 $9.98 per unit with one color imprint. Custom imprint setup is $50. Minimum order is 50 units. 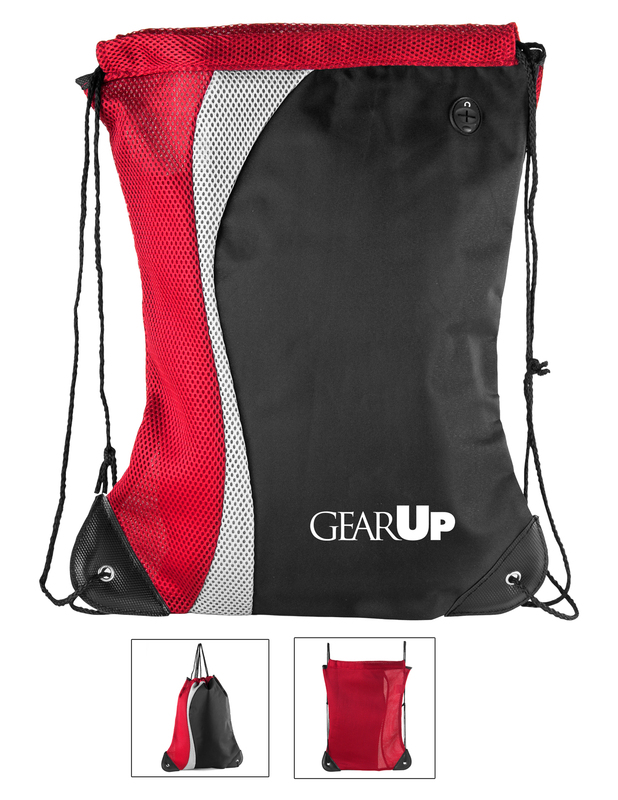 Sporty design and bold colors make this an eye-catching pack. 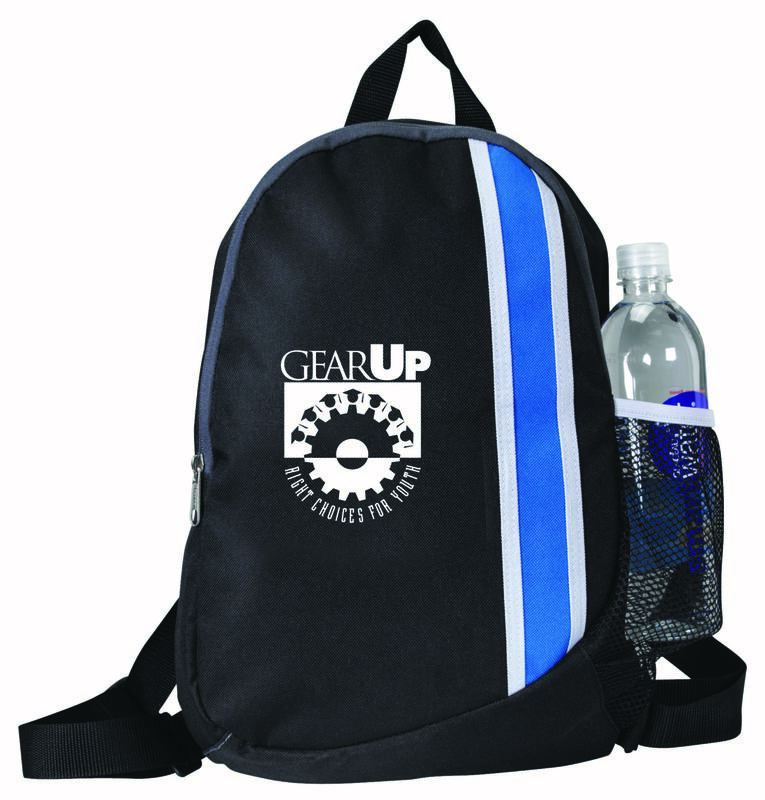 Features include front slash pocket, front zippered pocket with organizer, side mesh pocket for water bottle (water bottle not included), a front D ring for keys or carabineer, and a large main compartment. 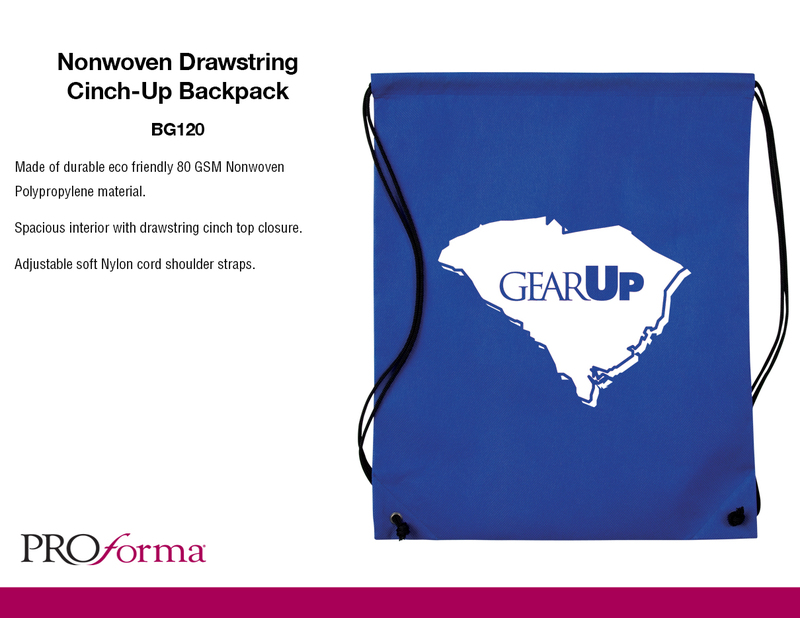 It also has adjustable, padded shoulder straps and top grab handle. 4 color options. 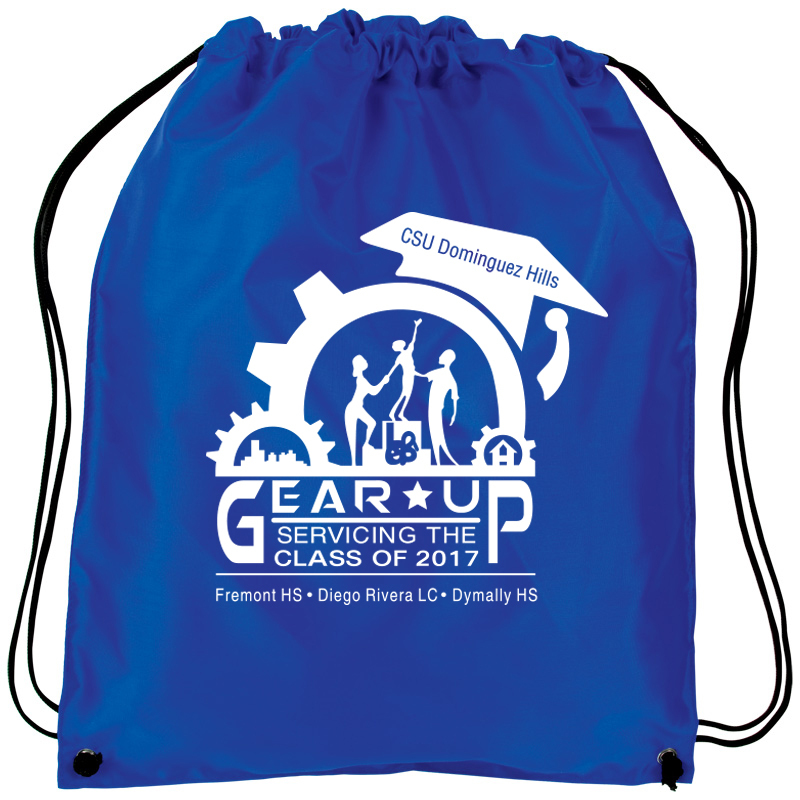 $8.98 per unit with one color imprint. 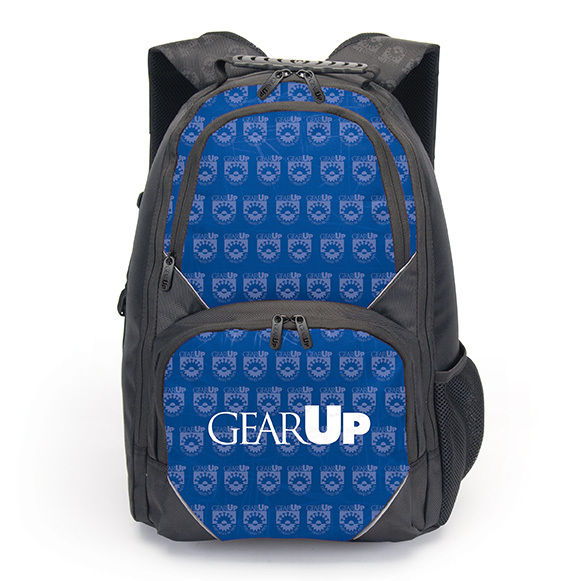 Custom imprint setup is $50. Minimum order is 50 units. 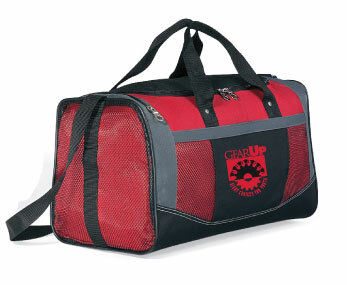 This sporty gym bag combines space and style. 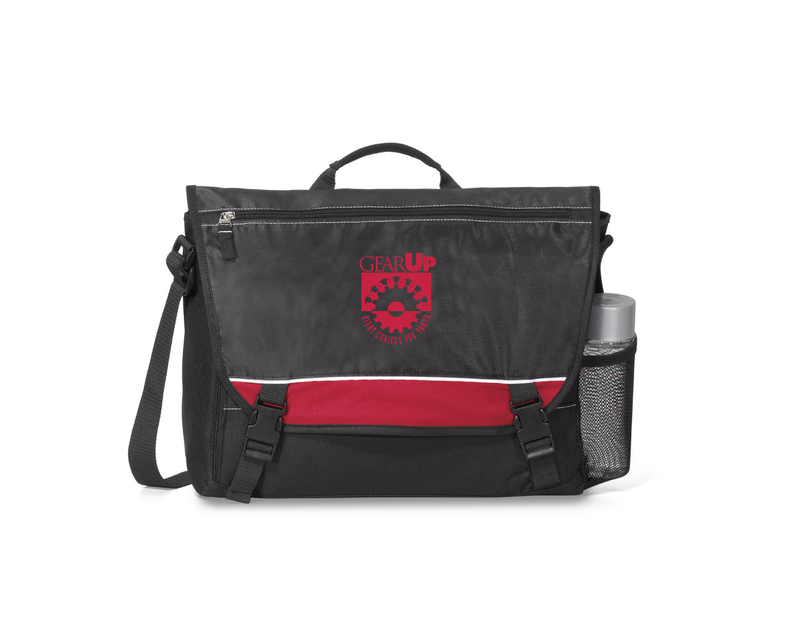 The exterior features a side mesh pocket for all your essentials and front mesh pockets, top grab handles as well as an adjustable shoulder strap. Inside there is a removable floor board for added stability. 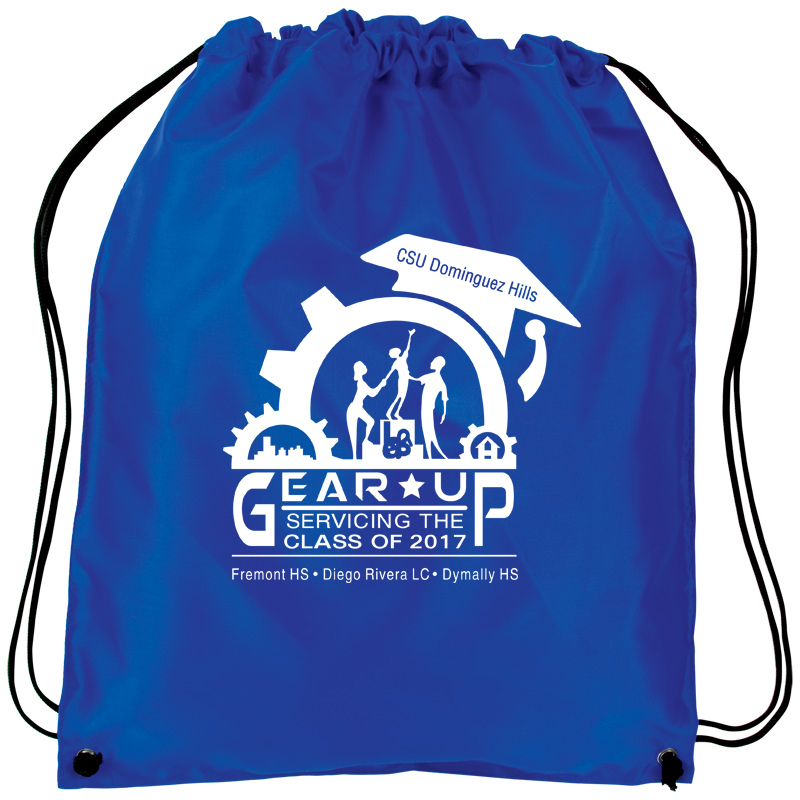 12 – 300 Units, $36 with any one color imprint. 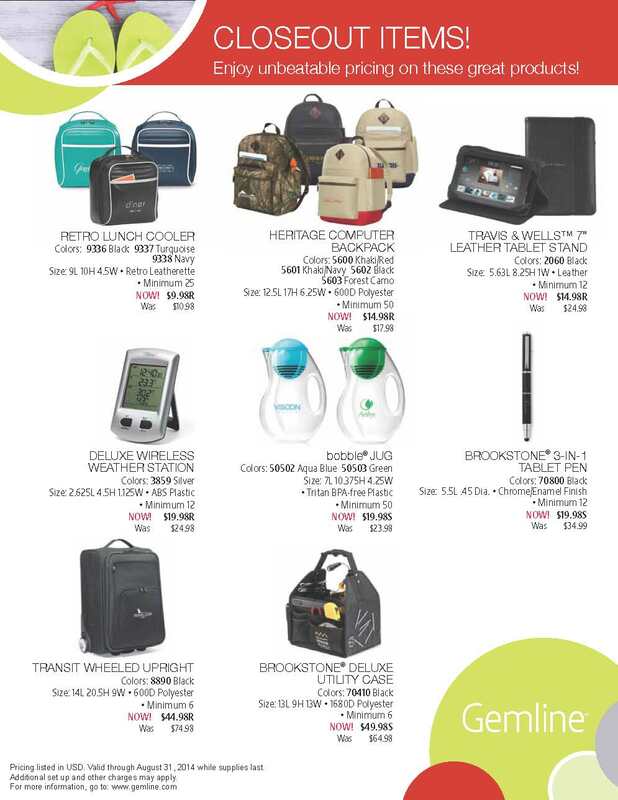 Sporty, stylish and very affordable.